Anyone who has read my various musings over the years knows that I am not into conducting amateur psycho-analysis on opposing fan bases. That said, every so often, the “real world” intrudes and basically confirms what I already suspect about the opposition. Such an intrusion was recently captured in a photo at Goss Stadium in Corvallis during Civil War baseball last weekend. Beavers Go “All In” For Crazy. A few years back, our own fan base had a huge problem at Autzen Stadium with one particular fan who put the stuffed mascots of other schools into a noose and bashed them in a mock hanging following each score. It was admittedly in poor taste, as well as being extremely juvenile, but it was notable because such a thing was extraordinary. Despite the uproar to make him stop, said fan still swings said mascots for each point while some fans count along to this day, while most look on with disgust and instead choose to count Ducky’s push-ups, a far nobler pursuit. What I have noticed about the OSU fan base these days is how ordinary their utter irrationality has become, both online and in real life. They’ve become unhinged—and it’s not an isolated phenomenon. So, on the one hand, we have people actually taking their time to write out something, not in support of the Beavers, but wholly centered on a hatred of the Oregon Ducks. On the other, we have a fractured online Beavers fan base which has an unhealthy obsession with all things Phil Knight, Nike, and also nurse dark visions about the motives of marketeer Tinker Hatfield. 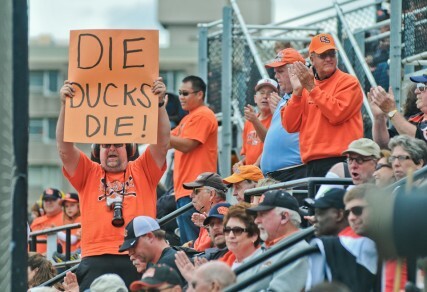 I first noted the Beaver fans becoming unmoored from reality about mid-last decade. They’d always been a cantankerous fellowship, particularly regarding Oregon’s perceived “unearned” success. 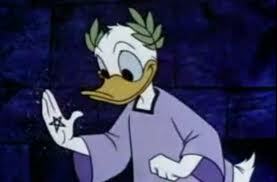 However, they were still more focused upon themselves than fixated upon their endless silly game of one-upsmanship trying to prove which is the biggest Duck hater up until about 2006 as they enjoyed Mike Riley’s lone 10-win season, (which only took 14 games to accomplish), and basked in the first of their back-to-back College World Series championships, the first actual winning done in Corvallis within living memory. Nevertheless, the unhinging also became apparent when they were at the zenith of their success in baseball, at a time in which the Ducks did not even field a team. In true Beavers fashion, they couldn’t afford excellence, and their coach, Pat Casey, was flirting with other programs in 2006. Who ponied up for Casey’s 10 year extension? You guessed it—Mr. Phil Knight did. One would think that would have built Mr. Knight, and by association, Nike, some goodwill in Corvallis. However, all of these good vibrations disappeared shortly after it became widely known in “Beaver Nation” that Nike was equipping Beavers football for 2007 in “sports bras.” It was April, 2007. In that one moment, Phil Knight went from seemingly a reluctantly acknowledged savior of bucktoothed baseball, the one highly performing Beavers athletics effort, to being at the center of a detailed conspiracy to make OSU a national laughing-stock. The next step in the conspiracy came in July, when Athletic Director Pat Kilkenny announced the end of Oregon’s scholarship wrestling program and declared an intention to reinstate Ducks baseball. This move was met with some consternation in Corvallis, but many sanguine Beavers fans, high on their recent College World Series success, declared publicly that it would be at least five years before the Ducks had a “competitive” program. It certainly didn’t help matters that in September, OSU football took their “sports bras” on the road to a 34-3 nationally televised beat down at Cincinnati, despite that being a typical Coach Riley out of conference road effort. After enduring all of the bile that came with seeing the Ducks briefly become the BCS #2 team in early November, they did eventually defeat Oregon in the 2007 Civil War—a Ducks team that was by then missing something on the order of eleventy-billion seconds of D-1 football experience due to injury. 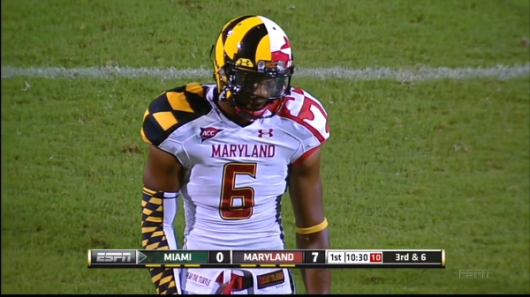 The final appearance of the “sports bras” was in the non-eventful 2007 Emerald Bowl, a 21-14 defeat to the storied Maryland Terrapins, coincidentally the only team that in the time since has actually managed to top Oregon State for worst uniforms in the history of mankind. Who knew then that minor bowl victory would be the Beavers’ high-watermark in all their entire athletic department going forward? The Curse of The Sports Bras was on, a full-blown conspiracy to oppress Beavers athletics, and the damage had just begun. Beavers baseball has not come close to sniffing another College World Series championship in the time since. 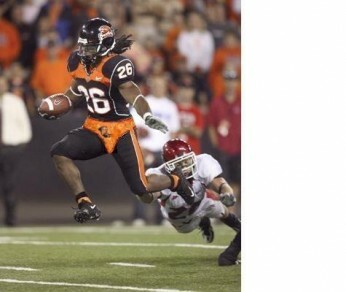 In 2008, the Beavers needed only to beat lower ranked Oregon at Reser Stadium to go to their first Rose Bowl since the Johnson Administration. 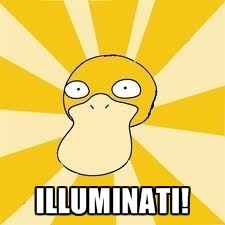 They were smoked by the Ducks to the tune of 65-38. Then they participated in the infamous 3-0 Sun Bowl, a game panned as the worst played bowl game of the modern era, the most unwatchable 3-hour block of television since the inception of the vacuum tube. In 2009, needing only to beat a higher-ranked Oregon Ducks team at Autzen for a berth in the Rose Bowl, they exquisitely failed 37-33. The Beavers were then killed in the Las Vegas Bowl by perennial Pac-10/12/14/16/18/20 non-invitee BYU, 44-20. You couldn’t have scripted it better. In 2010, in only their second season of reinstated baseball, the Ducks went to the post-season, becoming “competitive” a few years earlier than the Beavers’ expectations. Also in 2010, the Ducks clinched a national title game berth at Reser Stadium, while simultaneously dispatching the Beavers to a losing season. In 2011, OSU started their season in the ultimate of embarrassments, losing at home to FCS Sacramento State in overtime. Meanwhile the Ducks clinched a second Rose Bowl berth in three years first by beating the Beavers then destroying UCLA in the Pac-12 championship game, while OSU stayed home for yet another bowl season. Then, of course, Oregon won the Rose Bowl, unleashing a torrent of positive ink that all but drowned any lack-of-a-post-season talk about the Beavers. Beavers fans sometimes say their program has never been the same since the 2008 Civil War. That’s not true. They haven’t been the same since the Spring of 2007. It’s a curse, all spearheaded by a sports bra suggestive football uniform that we conspired to have Bobby DeCarolis and Mike Riley sign off upon. 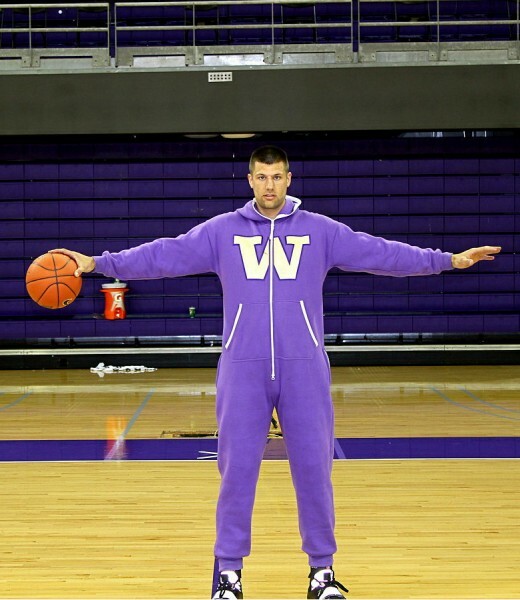 Up next, The Washington Huskies attempt their own version of self-mutilation: the purple onesie.